Frankfurt - Audi revealed a more practical version of its A5 and S5 Coupe, the new Sportback. Sharing the stage at the 2016 Paris auto show will be the flagship Audi S5 Sportback, which derives power from a new V6 turbocharged TFSI to deliver 260kW/500Nm. Powered by a V6, it will reach 100km/h in 4.7 seconds with a limited top speed of 250km/h. Audi says the the stretched wheelbase, short overhangs and long, wraparound bonnet featuring a power dome emphasise the dynamism of the five-door coupé silhouette. The three-dimensional singleframe grille is flatter and wider than on the previous model. The body of the A5 Sportback is the lightest in the segment according to Audi, this is done with an intelligent mix of materials makes it 15kgs lighter than that of its predecessor. The overall weight of the new generation has fallen by as much as 85kgs to just 1470 kgs. The A5 Coupe is due in South Africa in the early 2017, with the Sportback likely to join the range soon after. The appearance of the new S5 Sportback follows the form of Audi S models and is subtle yet appropriately brawny. The bumper, air inlets and side sills feature distinctive contours. Many of the S-specific styling additions are painted in graduated tones of matt grey. Aluminium inlays accentuate the design inside, while the exterior mirror housings shine in an aluminium look. The rear bumper integrates a black honeycomb grille, aluminium diffuser trim and the signature four tailpipes. A spoiler lip in body colour adorns the separating edge of the luggage compartment lid. 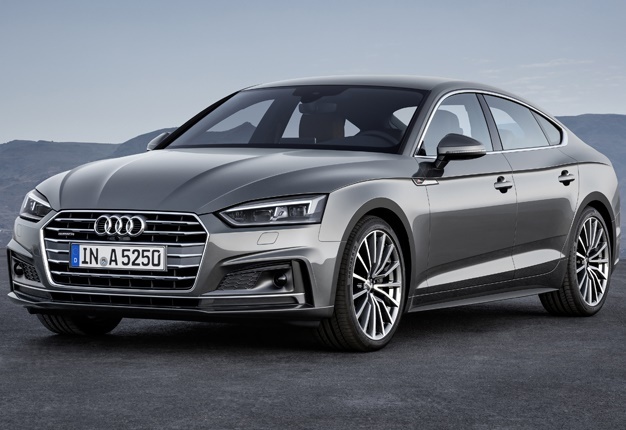 According to Audi, the new Audi A5 and S5 Sportback have grown significantly inside. The interior length has gained 17mm, the shoulder room for driver and front passenger up to 11mm and the rear knee room 24mm. With 480 litres of luggage capacity, the A5 Sportback rates among the best in its class. Audi also offers the option of sensor control for opening and closing the standard-fit electric luggage compartment lid. The rear seat back splits 40:20:40 as standard. The load-area width measures exactly one metre. The rectangular-shaped layout of the 480-litre luggage compartment makes it outstanding in terms of practical use. With the rear seats folded down, it can even accommodate 1300 litres. As an alternative to the standard-fit analogue instrument dials, the Audi virtual cockpit with its various display options brings the driver added convenience. The large, high-resolution TFT monitor measuring 12.3". The optional head-up display projects all relevant information onto the windscreen as easily comprehensible symbols and digits, thus enabling the driver to keep their eyes on the road. The driver assistance systems cover a wide range of functions in the new Audi A5 Sportback. An intelligent combination of different technologies enhances safety, comfort and efficiency. Meanwhile Audi is also taking the next step toward piloted driving. Playing a central role here is the adaptive cruise control (ACC) Stop&Go system including traffic jam assist. It relieves drivers in slow-moving traffic up to a driving speed of 64km/h by assuming the tasks of braking and accelerating the car, and it also temporarily takes charge of steering it on better roads. The predictive efficiency assistant, which evaluates GPS information from the car’s immediate surroundings, helps to save fuel by giving specific driving advice – a unique feature in this segment. Collision avoidance assist intervenes if the car needs to drive around an obstacle to avoid an accident. Based on data from the front camera, ACC and radar sensors, it computes a recommended driving line within a fraction of a second. The lineup is rounded out by other assistance systems such as turn assist, park assist, cross traffic assist rear, exit warning, camera-based traffic sign recognition, Audi active lane assist and Audi side assist. In Europe, there is choice of two TFSI and three TDI engine versions for the new Audi A5 Sportback. They produce between 140kW and 210kW of power. Compared with the previous model, Audi says fuel consumption is reduced by 22% while increasing power output by up to 17%. The top version of the 2.0-TFSI produces 185kW. 370Nm of torque is available between 1,600 and 4,500 rpm. It sprints from 0 to 100km/h in six seconds on its way to an electronically limited top speed of 250km/h. The second version of the 2.0 TFSI has an output of 140kW and 320Nm of torque. The four-cylinder TDI in the new Audi A5 Sportback develops 140kW and peak torque of 400Nm. With quattro all-wheel drive and the seven-speed S tronic, 100km/h from rest takes 7.4 seconds.